Thank you for your interest in the Volunteer opportunities with Family & Children’s Services of Guelph and Wellington County (F&CS). Volunteers contribute a variety of skills, experience and knowledge. They play an important role in the lives of children, youth and families and have a lasting and positive impact on their future. Our volunteers truly make a difference in the lives of children, youth and families. Volunteering includes supporting children, youth, and parents/guardians one on one. We accept applications from individual ages 16 and over, however only volunteers 18 years and older can volunteer in the following positions: Mentor, Youth Mentor and Driver. Due to the sensitive nature of our work, volunteers are required to provide a weekly commitment for a minimum of 8 months. Mentor, Youth Mentor, Tutor, Volunteer Driver, Childcare Assistant and more: Click here for details about the volunteer opportunities. Mentors are matched with a child or youth who need extra support and encouragement and benefit from regular one-on-one time. You can engage them physical activities, go to the movies or bowling, help with homework, give a listening ear. Parent Aides partner with a parent/guardian to provide support and guidance, emotional support and practical skills. Tutors provide one on one support with homework or school projects. The volunteer might be skilled in a specific subject(s). Volunteer Drivers provide transportation services to and from appointments for children, youth and families. Childcare Assistants support a family by provide childcare for children while the parent(s) attend a group/meeting, runs errands or simply just needs some time alone. Interested in gaining valuable experience and making a difference? Complete the application form and email it to the Coordinator of Volunteer Services along with your resume. Volunteers are provided with orientation and training and expense reimbursement. For more information you can download our volunteer brochure here. 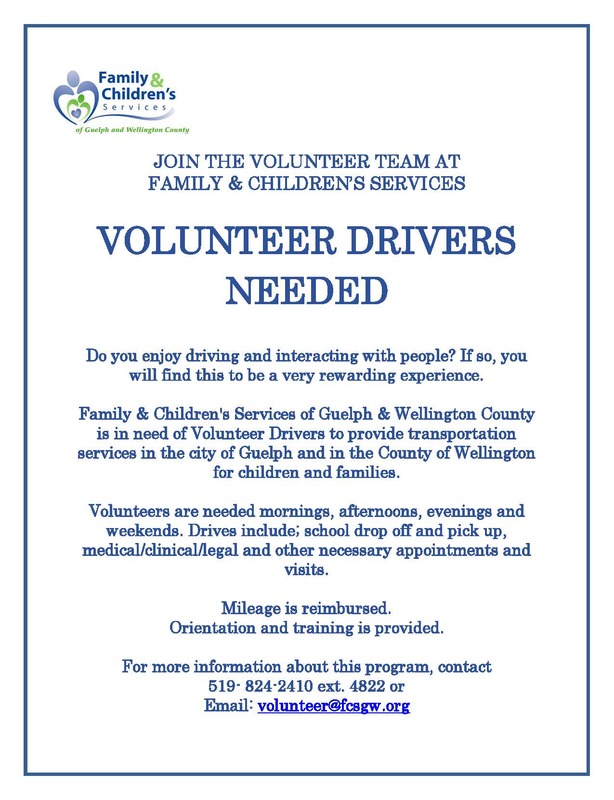 For more information about the volunteer driver position, click here for the poster. or call 519 824 2410 ext. 4822. We look forward to you joining the volunteer team!